"On Saturday and Sunday, February 12 and 13, San Francisco Museum and Historical Society will bring together more than 20 San Francisco neighborhood historical associations to create mini-museums in the Old Mint, showcasing their unique contributions to our City. Through photographs, videos and story-telling, each will show how the past has shaped its, and our, future. 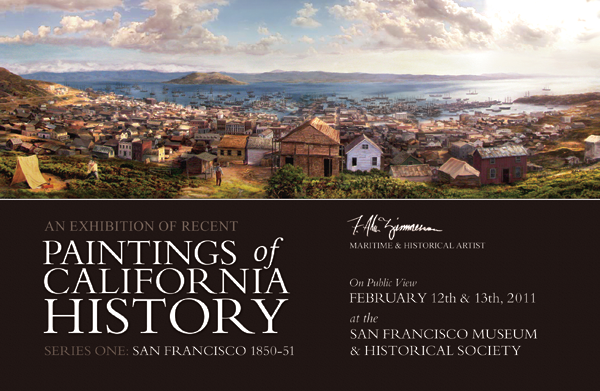 In addition, special art will be on display including large acrylic-on-wood panels by Frank Alan Zimmerman, depicting San Francisco in the 1850s." Hey, guess what?! Frank Alan Zimmerman is my brother!! If you're new to my blog, or live under a rock you may not have seen these posts: Wedding Painter or Movie Maker, but this exhibit is going to be the grandaddy of them all- the dude is majorly talented. He's painted 3 large-scale panels of historically accurate scenes from early SF history. Let me tell you: you're going to be blown away. Here's a sneak peek at one of them, which measures 5+ feet wide. Saturday & Sunday, February 12 & 13 at the SF Old Mint Building, 88 5th Street San Francisco, CA 94103 Hours for the San Francisco History Project are 11 to 4 PM each day. Alan will be there all day, both days, if you'd like to shake his hand and say hello.